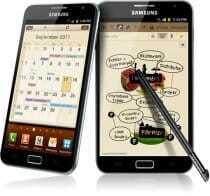 As we expected, Samsung prepares a big launch for its new Galaxy Note II in the United States and is already looking to cover as many buyers as possible. The company signed with all major distributors, such as T-Mobile, Verizon, US Cellular, AT&T and Sprint. The release date is not known, but officials say that it will be on the market by mid-November and every carrier will make his own announcement. Besides the HSPA+ 42 or LTE radios that will be chosen by every carrier, the US version of Galaxy Note II has the same specifications as the European version: 5.5″, 1.6GHz quad-core Exynos chip (2GB of RAM), 1280/720 pixel HD Super AMOLED display, as well as its own S-Pen for the TouchWiz flavored Android 4.1 Jelly Bean.